Hugo Chávez, the President of Venezuela, has been transforming the nation’s military from a professional fighting force to an armed militia under the command of the president, according to a senior military strategist and one-time member of the Venezuelan military. Over the past decade, there have been “transmutations” in the role and makeup of Venezuela’s armed forces. Quietly, under the guise of modernization and international cooperation, President Chávez is retooling the military as a force to quickly stamp out domestic opposition and to keep him in power, says Colonel (ret.) José Machillanda, a researcher and professor of graduate studies at Simón Bolívar University. Machillanda retired from the Venezuela military and is also member of the Frente Institucional Militar, a group of former officers. In his written in his soon-to-be-released book, "From Military Professionalism to the Militia," Machillanda says that back in 2001 during the beginning of his radicalization of the military, the president boasted, "Hugo Chávez needs no guerrilla front because we are backed by the people and my armed forces." The military was renamed by decree in July 2008 to the ‘Bolivarian National Militia’ and put under the exclusive authority of President Chávez. Numerous officer purges have eliminated all but the most extreme loyalists. Many observers are increasingly nervous at the gradual decrease of the independence of the military from Chávez’s personal and political agenda, and at the growing role of Cuban advisors embedded deep in the Venezuelan state. “We are at the mercy of meddling in areas of national security by a Cuban regime, which wants Chávez to remain in power because Chávez gives them oil,” Antonio Rivero, a retired brigadier general, told The New York Times. The closeness between the Cuban and Venezuelan regimes is no secret, and Cuban advisors have access to confidential information such as military planning, intelligence and the personal logistics of President Chávez. The United Nations Educational, Scientific and Cultural Organization (UNESCO) has, at least temporarily, suspended a $3 million donation by Equatorial Guinea dictator Teodoro Obiang Nguema. The money was intended for an award honoring scientists for discoveries that improve the quality of human life. However, after much protest from human rights groups, UNESCO decided to put the donation on hold while it assesses the situation. President Obiang is accused of siphoning the wealth from his own nation for the benefit of his close confidantes, friends and supporters, raising questions as to the source of the money to be given to the United Nations and whether the donation in his name is appropriate. A coalition of 200 such groups wrote a letter to the UN. "By creating a UNESCO-Obiang award, UNESCO is effectively endorsing his regime and undermining its own support for human rights," they said. The organization announced that it was bowing to worldwide pressure and would be reconsidering accepting the money from Obiang. The government of Equitorial Guinean said that the donation's refusal "forces us to relive the mistrust generated about Africa during centuries of slavery and colonialism. Equatorial Guinea senses that behind the controversy caused by the generous aid offered by our president for science and research, are the concealed intentions of Western institutions and lobbies continuing to relegate an African country as an inferior." The $3 million would have funded the award for five years. $300,000 would have been given to the winner each year, and an additional $300,000 would have been used for the selection process. UNESCO has not said that the award will not go forward—only that it has temporarily been put on hold. The Moroccan High Commission for Planning (HCP) has reported a drop in the use of child labor in Morocco over the course of the past decade. From 1999, when 517,000 Moroccan children between the ages of seven and fifteen (9.7 percent of that population) were engaged in labor, the number has plummeted to 170,000 (3.4 percent) in 2009. Human Rights Watch has cited Morocco as having “one of the highest child labor rates in the Middle East and North Africa.” Child labor is most prevalent in rural areas, home to 89% of Morocco’s working children. 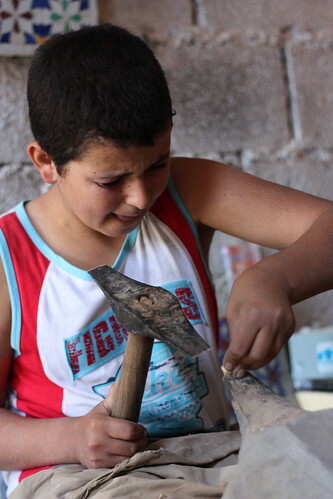 There, children work alongside their families in agriculture, the most common form of child labor in Morocco. The UN High Commission for Refugees has also listed construction, mechanics, carpentry, handicrafts, industry, and prostitution as common occupations for children, and has identified human trafficking of Morocco’s children both internally and across its borders as a problem. The Moroccan government has been making serious efforts to break the traditional pattern. In 2005, it launched a National Action Plan to Eliminate Child Labor. New legislation curbing child labor and trafficking now makes it illegal to employ children under the age of 15. Morocco has also been investing in economic aid, education, awareness campaigns, and various other programs in the hopes of solving its child labor problem.